I’m very pleased to announce the launch of our new app, Loopy 2! 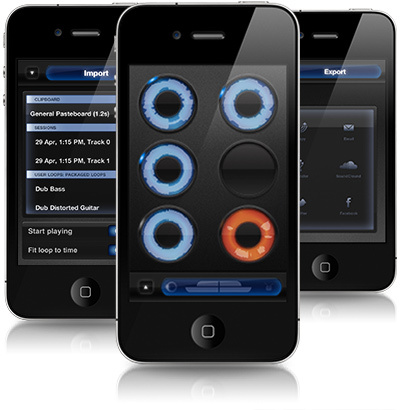 It’s a pretty, easy-to-use but feature-packed looper for making music by layering looped recordings of singing, beatboxing or playing an instrument (or banging cutlery together). It’s currently on sale for launch, so take a look! We’re very proud of it. We’ve just released The Cartographer version 1.1! Our biggest and most-requested new feature is offline map downloading — now, you can select a whole map region to download, and a level of detail, and The Cartographer will download the entire street map to your iPhone, for viewing offline. This video shows how it works. The second main new feature is map searching, so you can search for places by name. A tap converts search results to placemarks you can add to your map. Bulk placemark publishing lets you make lots of placemarks while you’re away from Internet access, and then when you have Internet access, publish them to your map all at once. And finally, a new list view shows you all placemarks on your map, ordered by how far away they are. You can also search your placemarks by their name or description. We hope you like The Cartographer 1.1! We sure do. Grab it on the iPhone App Store for $3.99. Here’s something I’ve just finished working on, ready for release very soon: Offline map downloading. 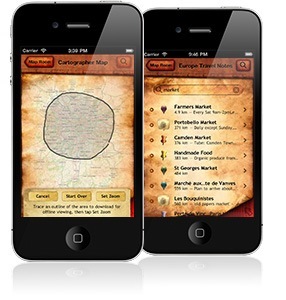 You can grab The Cartographer on the iPhone App Store — version 1.1 will be available shortly, and is a free update. When we release version 1.1, we’ll be ending our introductory 50% off sale, so grab a copy soon before the price goes up! Software should be beautiful, and should be a pleasure to use. The Cartographer combines antique cartography styling with cutting edge technology. On the iPhone 4’s Retina display, The Cartographer flaunts stunning high-resolution graphics. Subscribe to our newsletter to stay up to date and for a chance of winning one of fifteen promo codes. The Contest ends November 25th, 2010 at midnight GMT. The winner will be notified via direct message on Twitter. There is no restriction to the number of entries so tweet your little hearts out! Chris Guillebeau’s “Travel Master Kit” includes three e-books – “Frequent Flyer Master”, the “Discount Airfare Guide”, and “Travel Ninja”, complete with bonuses. Read more. With a desperate need to debug a lengthy regular expression destined for use with the excellent RegexKitLite library, I have quickly put together a Mac OS X application. Reginald is a kindly old gentleman devoted to assisting you with those tricky regular expressions. Provide some sample input, and your regular expression, and Reginald will provide you with colour-coded output and a list of all your matches and the corresponding capture groups for your exploration. Select a match or capture group in the list to the right, and the corresponding text will be selected in the panel to the left. 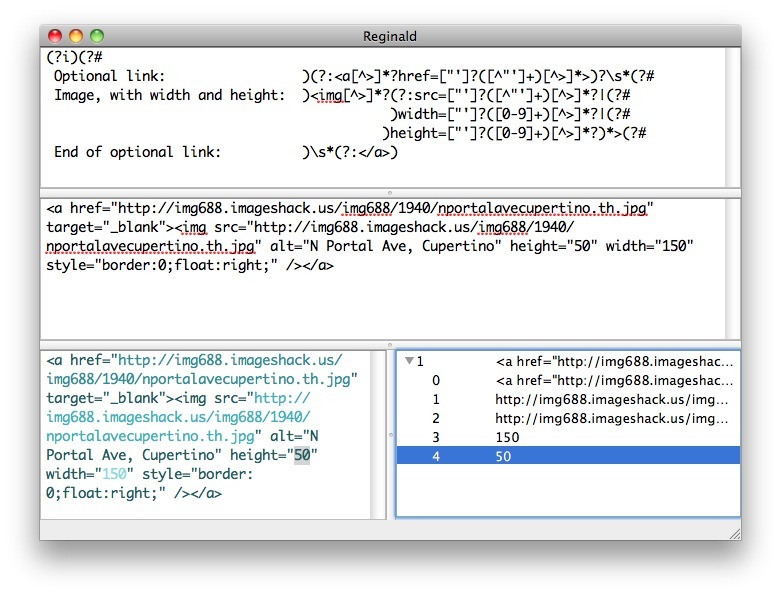 Reginald is built on RegexKitLite, and so uses the ICU syntax. It will run on Mac OS X 10.6 and above. 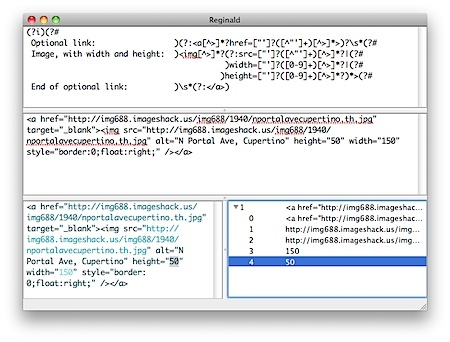 Download Reginald here, or access the source on GitHub.